Sometimes you get a little beyond peoples’ ability to imagine when you start describing what, as far as you’re concerned is a simple SharePoint solution. It’s not hard. Depending on how often your audience has been exposed to SharePoint, their ability to imagine might be quite limited. We are facing this challenge right now, and we are going to work through it by building a straw man solution. If we are lucky, we will roll a 7 (since many of you just returned from Vegas) and we will be able to continue building from our first result. If we are not so lucky, we will roll an 8 and we will be able to continue to roll and maybe work our way into another 8, at which point everyone wins. If we totally miss the boat, we crap out, we tear it down and we start over. If we don’t go nuts, if we don’t spend a lot of money, if we don’t invest a lot of time, none of those options are going to make me cry. Keep in mind that I am not the one building the solution that we might tear down so someone on my staff might cry a little. Why would I do this? Why don’t we just ask people to trust us? Why don’t we draw a bunch of illustrations in Viso and PowerPoint and make them sit through a boring presentation full of buzzwords and jargon and technobabble that none of them will understand? That approach has worked in the past…hasn’t it? Oh, right. Assumptions – The process will require support in the form of a site on our on-premises SharePoint server that will house critical support content and historic content and business records. The content deemed critical for operational support will be replicated in a SharePoint Online site. The stuff that is so critical for operational support that we just can’t risk ever being without will be included in an iPad app. If you’re wondering why we don’t just move the whole shooting match to the cloud, there are two reasons: 1) Bits of the historical information processing relies on add-on products that aren’t fully in the cloud yet, and 2) We’re scared. OK, we’re not scared but some people are and we think that asking them to take baby steps is better than asking them to run a marathon. If you’re wondering why we don’t just point the iPad at the SharePoint online site, there are two reasons: 1) Bad things happen. During the snowstorm in 2011, we lost power for 10 days and cell service for 3 (we did have a working land-line phone), and 2) We want a dirt-simple process and nothing says simple like pushing a few buttons on an iPad. If you’re wondering why we aren’t using a different brand tablet, one that might work better with SharePoint for example, well lets’ just say that we aren’t and leave it at that. Straw Man – We have agreed to focus on one library that we know will be included in any solution that anyone involved could dream up. We will replicate that library in SharePoint Online and we will wire up a quick and dirty workflow to keep the in-house library in sync with the online version. We will also create a one or two tab iPad app that will include the information that is related to the content in that one library. The manager of the customer department likes the approach. We will show the straw man to everyone else involved in the project to help them better imagine the nature of the full solution. We have an agreement, we will tear this down and start over if we have to, but we don’t want to do that twice. If you know me, this post might seem a bit out of character. I like prototypes, but in the past I have always said that prototypes should be disposable. This won’t be a prototype, this will be a gamble but it’s a risk I’m willing to take. 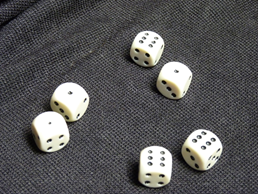 This entry was posted in ECM, Life with SharePoint and tagged craps, design, development, iPad, prototype, SharePoint. Bookmark the permalink. ← Good Question, the Answer is Yes! Picture – That’s a composite shot of some pictures. I had one of 5 and 3, but I could not work it in without it being obvious. I hope that isn’t a sign.